Short: anything between 6 miles and 7 miles: 6 miles straight to Barwell town centre and back; 7 miles if you also add on the Tudor Road loop at the end. 6.15 meet for 6.30 departure. Hi viz please. 30 minute session Down Church Walk and Up Castle St long loops with a short recovery after every lap. 6.15pm meet in the ‘downstairs room’at the leisure centre for a prompt 6.30pm start. Unfortunately Desford Striders have had to cancel Sunday’s race at Bagworth Heath. This is due to abandoned horses being loose on the course, making it too dangerous for runners. The next cross country league race will now be Sunday 11 December at Bradgate Park. Details to follow. Drake Drive / Normandy Way / Nelson Drive loop – In 3’s, 2 on 1 off. Or meet at Drake Way, on the Corner at Rayleigh Close for 6.45pm. The route is 8.6 miles in length; to add an extra mile, you can add on the ‘Tudor Road / Hollycroft’ loop at the end. For those that don’t want to run this far, you can make it into a 6 mile route by turning back towards the leisure centre at the ‘Steaming Billy’ (Railway). 6.15pm meet in the room downstairs at the leisure centre. 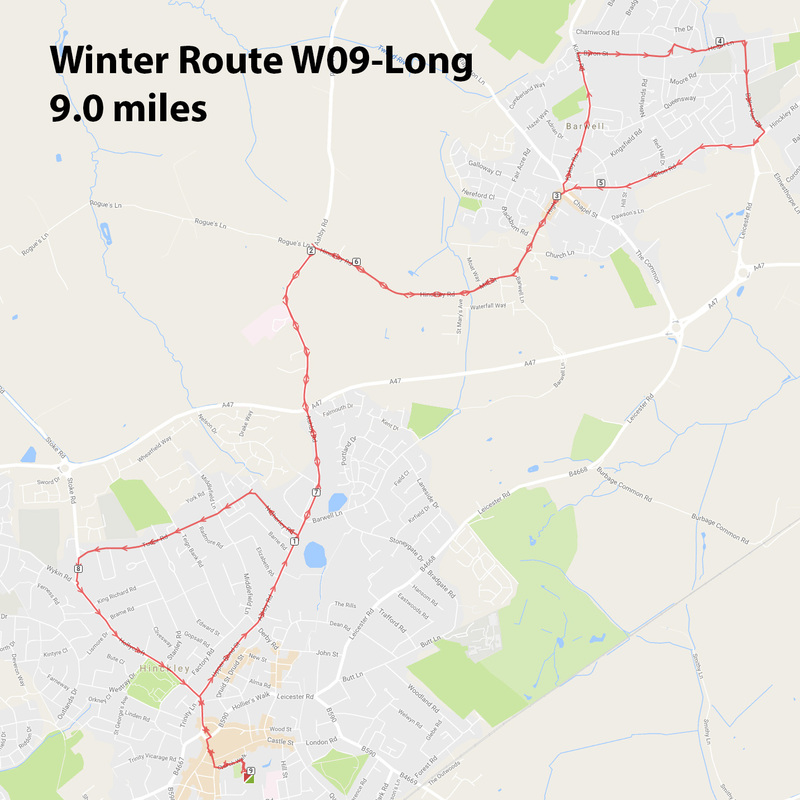 For those who are running from the leisure centre rather than participating in the ‘head torch’ run kindly organised by Mark, the route is the winter route 16 – W16. There is just one route as there are several points that this can be shortened for those that prefer to run fewer miles. A large number of the Thursday crew are running from Stoke Golding on the ‘head torch run’ so if you are planning to run from the leisure centre, could you ‘like’ thE Facebook post just so we can ensure that everyone running from the Leisure Centre has someone to run with. CAR SHARING IS ESSENTIAL. CAR PARK SPACE IS LIMITED AT THE SCHOOL. ONLY CARS WITH 3 OR MORE PEOPLE WILL BE ABLE TO PARK IN THE SCHOOL CAR PARK. If you are only coming for the junior race, please park in the staff car park to allow easier exit at the end of your race. There are no changing facilities, but toilets are available in the school grounds. Car share for Hinckley runners : Meet at the Old Leisure centre car park from 9:15am to leave at 9:30am. We hope to see you there and that you can take part in the cross country fun! Remember your hi-viz tops and head to the meeting room downstairs at the leisure centre…6.15 meet for a 6.30 start.